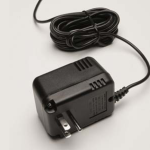 This is a Class II power supply for CASA200 and CASA201 cameras. The 22 AWG cable is 15 feet long. 120 VAC input. Outputs 800 mA at 12 VDC.